Description: Tufted annual or short-lived perennial to 1.2 m high; culms erect or geniculate at the base, slender to moderately stout, stiff, smooth. 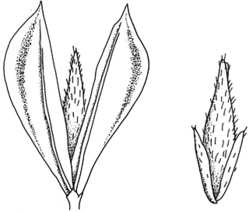 Leaves with sheath smooth or slightly scabrous, rounded on the back, the uppermost inflated; ligule membranous, 3–8 mm long; blade 4–12 mm wide, glabrous, scabrous. Panicle spike-like, 1.5–7 cm long, erect, dense, whitish except for the green nerves. Spikelets strongly laterally compressed, imbricate, 6–10 mm long, deciduous above the glumes at maturity. Glumes persistent, abruptly acute, equal, 6–10 mm long, similar, 3–5-nerved. Sterile florets 2, subequal, 2.5–4.5 mm long. Fertile lemma 4.8–6.8 mm long, 5-nerved, tough; palea 2-nerved. Distribution and occurrence: Cultivated for grain for caged birds, naturalized on disturbed and sandy soils; widespread. Native of Medit. region.